Clear stamp featuring the sentiments "Congrats", "New Job", "Engagement", "Wedding", "New House", "Graduation", "New Baby", and more. Penny Black clear stamp featuring a "no. 1" trophy with bear peeking out, with the words "dad", "mom", "grandma", "grandpa", "brother", "sister", "friend", and "teacher". 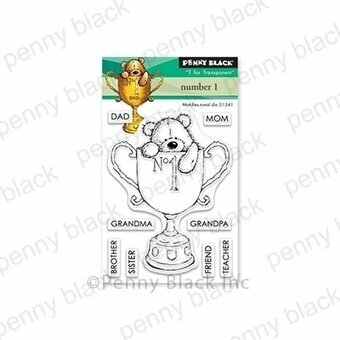 Penny Black clear stamp featuring teddy bears and the sentiments "Congratulations", "You make me smile", and "You're so cute". This clear stamp set features two dressed up pigs, group of flying pigs, spinning ping, and sentiments "Congratulations! I'm tickled pink!" "Hogs & Kisses" "Happy birthday pig out!" "Laugh until you snort!" "Age doesn't matter when you have style!" "It's your birthday, go hog wild!" "Pig out!" "Life is a balancing act, ham it up!" "Miss you pig time!" "Sow's it goin'?" "Thank you sow much." Includes 15 pieces. 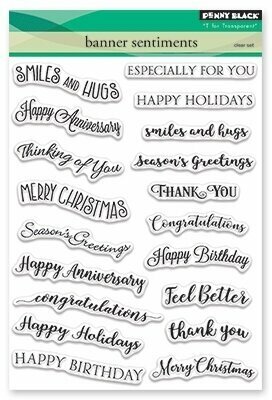 Clear stamps from Uniquely Creative featuring the sentiments "Happy Birthday", "Thank You", "Congratulations", "Best Wishes", "Make a Wish", "Sending Hugs", "Get Well Soon", and "Merry Christmas". Clear stamps from Uniquely Creative featuring the sentiments "You Totally Rock", "Good Work Mate", "All the Best Bro", "Happy Birthday", "Congrats", "Thanks Heaps", "Party Time", and more. 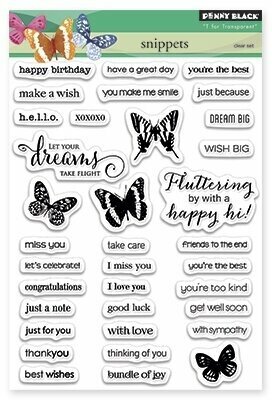 Clear stamps from Brutus Monroe featuring flowers and the sentiments "Happy Birthday", "Happy Anniversary", "Congratulations", "I Love You", and "Thinking of you". Clear stamps featuring flowers and the sentiments "Happy Anniversary", "Love Always", "Congratulations", and "Someone Special". Designs by Sheena Douglass. Acid & lignin free. These versatile and easy-to-use stamp sets are a great way to create beautiful and elegant cardmaking projects. To use these stamps simply peel them from the backing sheet and place onto a acrylic block (not provided) ink the stamp up and stamp. Once you are done simply peel the stamp off the acrylic block and wipe clean with an alcohol free baby wipe or wash in soapy water, leave to dry and return to the clear backing sheet. 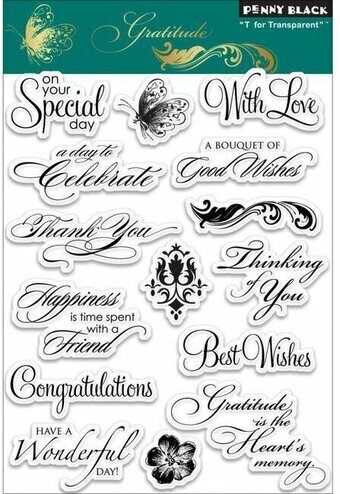 A set of Penny Black Clear Stamps featuring the sentiments "On your special day", "A day to celebrate", "With love", "A bouquet of good wishes", "Thank You", "Happiness is time spent with a friend", "Thinking of You", "Best Wishes", "Congratulations", "Gratitude is the heart's memory", and "Have a wonderful day". 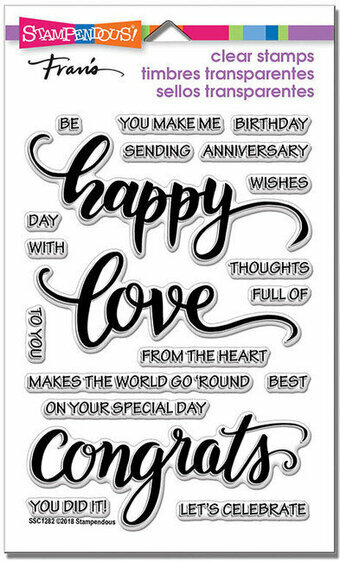 Clear stamp from Picket Fence Studios featuring flowers and the sentiments "Congratulations of your big day", "I am only a call away", "You make me smile", "It's a party", "Get Well", and more. Unique, beautiful and creative stamps designed by Nicole Petersen. Use with paints and inks. Perfect for card making, journaling, scrapbooking, and mixed media. This clear stamp set is called "Silver & Gold", because we think this set will look awesome with those colors. BUT, you are not limited to those colors of course. This set is fantastic for all colors and styles. This super hip 4 x 6 stamp set consists of 5 images and 6 sentiments and 19 supporting images. Approx. sizes: large star - 1 3/4" x 1 1/2", triangle border - 3 3/4" x 1/2". Ideas to note: 1) Combine images to stretch this set even further. 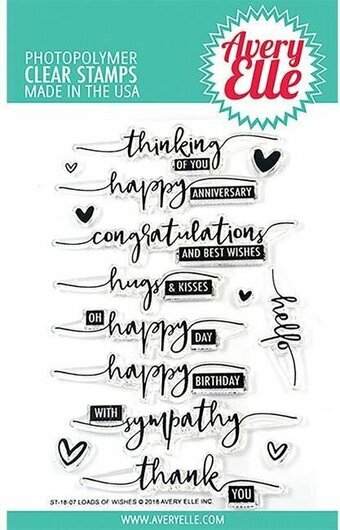 The Yay for You stamp set features a jumbo greeting in a bold, outline font. 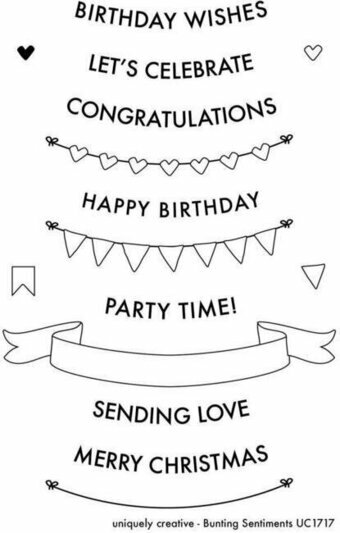 Mix and match the extensive assortment of phrases to build enthusiastic greetings suitable for any celebratory occasion. This 19 piece set includes: "Yay" 2 9/16" x 1 5/8", Sentiments (18) ranging from 3/16" (yay) to 3 3/16" (commencing happy dance) in length. Clear stamp sets include the name of the set on the sticker for easy identification. Our clear stamps and Die-namics are made in the USA. Our Banner Bits stamp set can be used for endless occasions and cards. 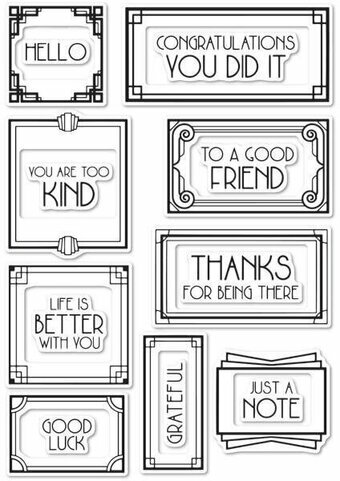 This set includes sentiments for birthday, thank you, encouragement, sympathy, and much more! 16 total stamps. Banner stamp measures: 3 9/16" x 3/4"; heartfelt thanks sentiment measures: 2 3/4" x 1/4"; cheer up sentiment measures: 1 1/2" x 5/16". Our Exclusive clear stamps are proudly made in the USA. These 15 clear stamps will give you plenty to chat about! 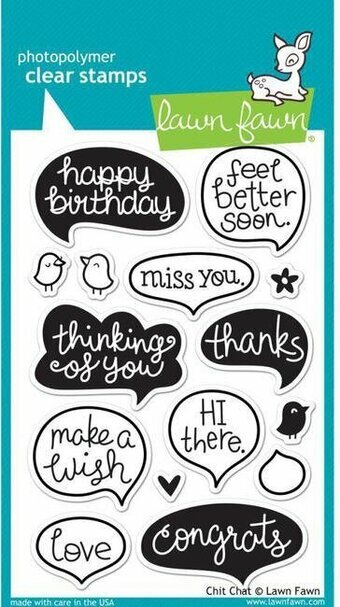 There are nine speech bubble sentiments to choose from, so you'll have the perfect words for any occasion. This set includes cute birds to do the "chatting" for you, but it also works nicely with Lawn Fawn critters! This stamp set coordinates perfectly with Chit Chat Lawn Cuts custom craft dies. Approximate stamp sizes: [congrats bubble] 2 1/16"W x 1"H, [feel better bubble] 1 5/16"W x 1 1/4"H, [happy birthday bubble] 1 7/8"W x 1 1/4"H, [solid bird] 3/8"W x 1/2"H.
Penny Black slapstick cling stamp featuring a butterfly, flowers, "Thinking Of You", "Happy Birthday", "Best Wishes", and "Congratulations"
Show your achievers what superstars they are to you with his wonderful all-in-one greeting plus image. Image measures approximately 5" X 3-3/4". This Taylored Expressions Cling Stamp features the sentiments "Thanks", "Congrats", "Bee Happy", "Happy Day", "For You", and "Friend". 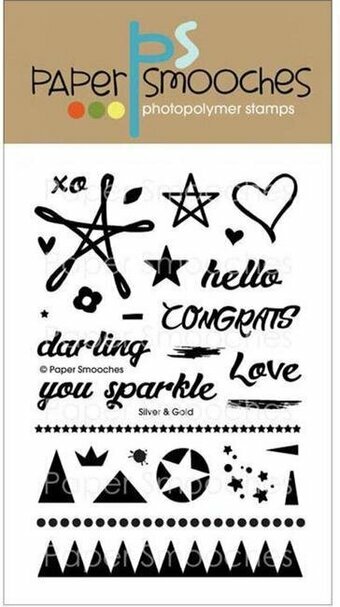 Tim Holtz cling stamps featuring pennants with the sentiments "Thinking of You", "Miss You", "Lucky", "Brave", "Best Day Ever", "Congrats", and many more. These red rubber stamps come mounted on cling foam so you can use them with any acrylic block (sold separately). Great for using with Tim's signature distressing techniques! Stamps come on a 3-hole punched sheet for easy storage. 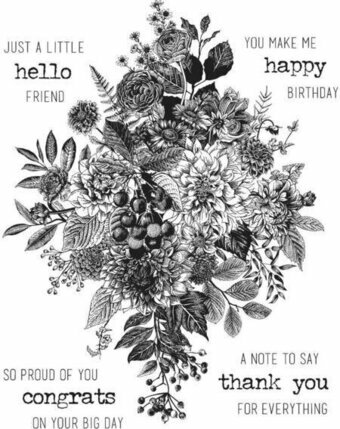 Tim Holtz cling stamps featuring a bouquet of flowers and the sentiments "Hello", "Happy Birthday", "Congrats", and "Thank You". These red rubber stamps come mounted on cling foam so you can use them with any acrylic block (sold separately). Great for using with Tim's signature distressing techniques! Stamps come on a 3-hole punched sheet for easy storage. Create retro themed paper craft projects that bring back memories from your youth with nifty images of a classic coupe, an old fashioned air plane, as well as a high wheeled bicycle! Complete with several flag and banner sentiments, this reminiscent cling stamp set is sure to bring a touch of nostalgia to all of your handmade cards, scrapbook pages and altered art pieces! Warning: use of these images may evoke feelings of being young again! Approximate Image Sizes: 1. Classic Airplane: 4.0" x 2.5", 2. Classic Coupe: 4.0" x 2.0", 3. High Wheeled Bicycle: 3.25" x 3.5", 4. Best Wishes Flag Sentiment: 2.75" x 1.5", 5. Congratulations Banner: 3.0" x 0.75", 6. Prop Accent: 1.5" x 0.25". These cling stamps are ready to use with Acrylic Blocks. Included with stamp set: 1. Storage panel for use with a two or three ring binder, 2. Stamp packaging can also be used as a storage box for the stamp(s).